Delete a Windows Service Using the Command Line Developing and debugging Windows Services in Visual Studio 2005 usually means creating setup projects to install and uninstall them. One of the quirks of using installers, however, is that sometimes the Windows service fails to uninstall. Below is the manual way of deleting or uninstalling a Windows service using the command line in Windows Vista and XP. C:>sc delete [service name] The utility also has other functions relating to Windows Services. Check them out. Diving back into the basix of Music. 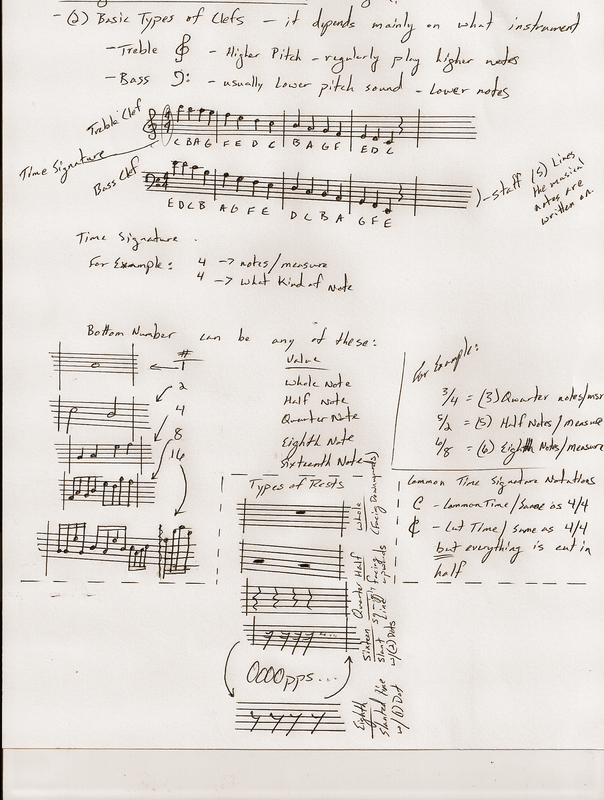 . . great chance to review the fundamental make-up of sounds from the aspex of : notation/syntax, time signature, format. Here’s a scanned copy of my notes. . . more will follow as I continue reviewing (and learning). So why the interest? Well I honestly grew up playing Brass (as 1st Slide Trombone) and played everything on the basis of slide placement and merely associating the notes by mere bi-produce of placement/sound/and visual placement of notes on the staff. You may laugh, but I could never tell you the difference between an A to Am on paper – only by playing. So I want to change that for (2) reasons. I want to speak to what I’m playing in words, then the play/demonstrate approach. The other reason? So I can transition into the string-side of instruments. Particularly the Piano and Electric Guitar. Having both and not knowing how to play anything beyond chop stix or Mary-Had-A-Little Lamb disappoints me. I have wanted to play – the Mat Kearney, the Foo, and Ben Folds – for way to long, it’s time I learn to understand music once and for all.
. . . and the update came sooner, than later. . . I can now play the Mat Kearney Song ‘Chicago’ on the Piano. Look the lyrix up! And if you get a chance – catch one of his concerts. Just went to the HOB in San Diego (2) weeks back to watch him perform, along with opener – Vedera. Both artists will rock your sox off! Sharepoint. Metadata. Folders vs Columns. It’s happening as we speak. . . in email, fileshares, enterprise repositories, even social networks (FB or Twitter). People are exchanging data, information, ideas. And as we do – we likely give context, association, and meaning to user-to-user, or user-to-audience, collaboration. I’m talking about sharing data about data -> Metadata. Facebook (FB) User ? A socially interactive form of metadata. Browse the People : status updates, friends/networks, pictures, and events. All the conversations, relationships, and interests are attributed to the content. Social metadata. Business Scenario ? Glad you asked. If you’re delivering an email to your team you’re putting context around the message so the audience can understand what they have at the inbox : who is it from, the subject line, and what does the message body say about the attachment. All metadata? Kind of. Let’s break this down in a # of ways. These are all normal actions we understand and exercise on a daily basis. Fundamental compenents that make-up the communication process. Now the big question. . . How would you manage that content : Delivery? Search? Share? Review the information breakdown(s) above and take a moment to think about it. What about files that are stored on a team member’s workstation? What if he/she is out for the week on vaca? How will your team get that file, or know where it is? Welcome the new-hire. If he/she looks at a data file share they see a list of files and types. Where is that metadata, contextual meaning, and understanding? In those emails he/she never had. You see how information breakdown works? Understand the technology layers involved? And how complex it is for users to retrieve the data about data? That’s why I think solutions like Sharepoint will change the course for many users in the business environment. It enhances how we collaborate, centralizes the data, and helps that new user understand the data captured with context, association, and meaning. It changes our Technology Breakdown. Returning the purpose of email into a messaging system (not a content repository), you’re capturing metadata around a document (otherwise lost in email conversations that aren’t captured in the file repository), and the ability to find those and share those require pairing up emails with fileshare documents; there is no easy way to auto-connect the metadata and unstructured content (files) together. Let’s take a document library for example. You have the ability to add columns (metadata categories) used to attribute characteristics to a document. (assuming the fields are required vs optional). When you upload documents into the library you are then requested to attribute the upload with context. (name, activity, strategic function, assigned to, versioning, etc). It’s no different than uploading a pix to a photo album on facebook, describing the album, adding captions to the pictures, and then tagging people in them. In the instance that you’re a company uploading (tranferring) documents from a data fileshare, you are mostly applying a metadata framework with all your files. Think about how you’re storing content on the file share. You probably organize your folders by year, business area, projects, departments, etc. If you drill down through these folders to a particular file, take note of the folders you went through to find that file. If you want through something like this . . .
Each Folder would be an example of a Sharepoint List Column you would create to translate the metadata principle into a function of filtering/sorting all files in a single list. I strongly encourage you to adopt this approach and DO NOT create folders in document library lists because you will cripple the intent and purpose of a sharepoint list in the first place. You now have consolidation of content, captured metadata, and greater efficiency to finding (and learning) about the business you work in. And remember – It’s happening as we speak. . . in email, fileshares, enterprise repositories, even social networks (FB or Twitter). Think about how Sharepoint will help People exchange data, information, and ideas. Embrace the technology and fabricate your collaboration framework into a solution that you can apply greater context, association, and meaning to collaboration. I’m talking about Sharepoint. Metadata. Folders vs Columns. It’s your choice. Find Your Own! And couple more for all you Clubin’ MoFo’s! Looking to consume SAS data via Sharepoint ? Look no further. SAS recently released v1.1 webparts for Microsoft Sharepoint. Allowing sharepoint site owners to present SAS Dashboards and Analytix on your site(s). If I understood the SAS Admin correctly, in order to use the BI Dashboard Web Part the company should own the SAS BI Dashboard Server. I would like to see this functionality and hear the advantages of this web part (e.g. drill downs, interactive behaviors, etc) since I do not have the luxury to try this. However, the Store Procedure web part appears to be working great with the exception of one known problem – RSA Key Errors. Yet to determine if the issue is IIS or Sharepoint related. I’m not convinced this is not a SAS issue per se. In the post-install config process you are instructed by SAS to modify key values in the webpartssetup.bat script which change the xml settings defined in the web.config file located at x:\inetpub\ . . * . . .\virtualdirectories\80 – After configuring the *.bat file, you execute it to the settings.
. . . Back to Sharepoint you pick/create your site collection – add your web part(s), modify shared webpart, and you should see the server settings reflected from the userdefined settings you defined for the web.config. In the web part control panel I choose an available web part and then exited edit page mode. I’m not convinced that this is a SAS related issue, but how the RSA key is to contact Microsoft and decrypted the web.config settings? If our SAS admin touches the sharepoint site, he gets this error. If I used a sysadmin account to touch the sharepoint site – it seems to repair the underlining issue (again unknown) that will allow webpart(s) to stop failing. . . but tomorrow – back to the same error. I’m scratching my head. . . Any thoughts SAS or Microsoft? Anyone? If you’re an administrator of BMC Service Desk Express 9.x , you might find these SQL Statements helpful for retrieving the following SDE ticket types. Expand upon the statements as you need to introduce JOIN or WHERE Clauses. . . The above will get you started anyway. If you need help – just ask. SQL Database. Search All Tables. Stored Procedure. Incase you’re looking to find a value tucked within the database but can’t remember the table, let alone the field, you can introduce this ‘SEARCHALLTABLES’ stored procedure (see the following). It will take a search string as an input parameter, goes to search the following column types. IMPORTANT NOTE : this will only search “ALMOST ALL” tables. It will search the tables that all users that have current access to the database. User created tables & System Tables are excluded from this procedure. char, varchar, nchar – owned by ALL users within the current database. If you want to modify the DATA_TYPEs you can introduce those in the WHILE LOOP of the Stored Procedure. Once the STORED PROC is created you can execute the following . . .
Aiming to reduce fat, gain muscle, and earn endurance this summer. With rowing on the mon-wed-saturday schedule, I needed an alternative, low-impact sport on the off-row days. I’ve decide to start at 10+ miles per/off-row days for the next (2) weeks before I bump the distance at increments of (2) per week following – until I can sustain a 50+ miles per/off-row day ride. A cake-walk for some, but I don’t want to burn out too early. So here’s the plan. . . and hold me to it. and so on – – – I may increase the pace of distance if the goal doesn’t seem challenging enough. I recently spoke with a Sharepoint Admin (Justin) from Transatlantic RE (transre.com) regarding a migration issue of content within any type of sharepoint list containing a field using “People or Group” type data. A value entered into this field is validated against WinAD which can be in the format of inital, name, sid, or email. After trying the above steps, I achieved the same problem; no value was retained during the above migration steps. The only option I found feasible was the backup/restore methods what retains the list values for the individual(s) assigned within the list. Use these commands . . .